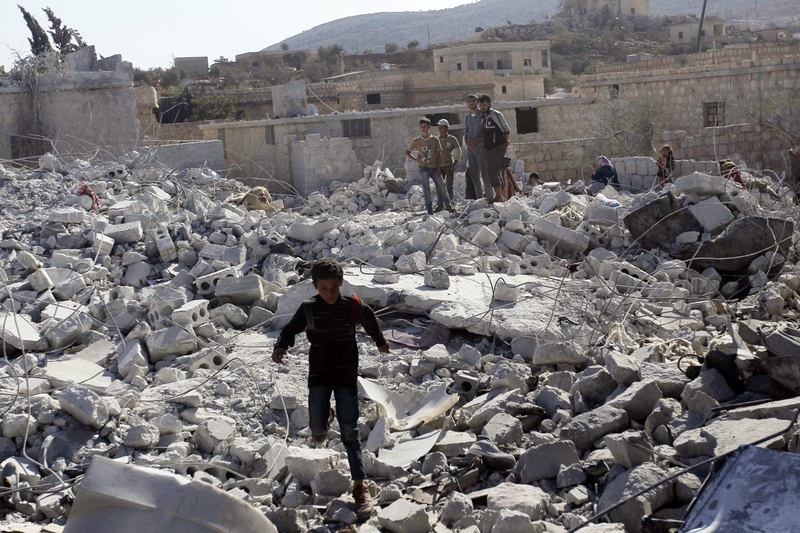 The immediate aftermath of a coalition airstrike on Syria in October, 2015. Al Gharra is a mud-brick village built on hard, flat Syrian desert and populated by the descendants of Bedouin. It is a desolate place. Everything is dun colored: the bare, single-story houses and the stony desert they stand on. There is not much farming — it is too dry — just a few patches of cotton and tobacco. 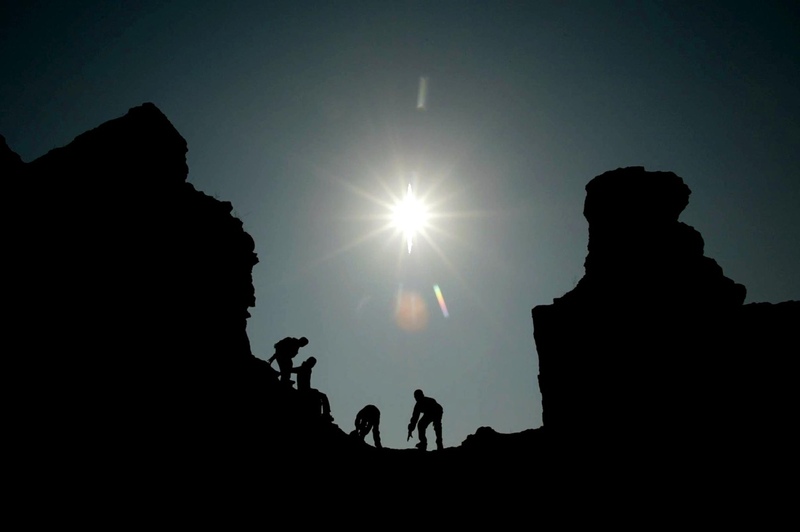 Before the war, villagers got a little money from the government to look after the national park on Mount Abdul-Aziz, a barren rock that rises 3,000 feet behind the village and stretches miles into the distance. Mount Abdul-Aziz is named after a lieutenant of the 12th-Century Muslim warrior Saladin, who built a fort to dominate the plain below. There is a military base there today too, which changes hands according to the fortunes of Syria’s civil war. In 2011, the regime of Bashar al-Assad held the base; next it was the rebels of the Free Syrian Army; then the so-called “Islamic State” (IS); and finally the Kurds, who advanced and took the mountain last May under the cover of American warplanes. Abdul-Aziz al Hassan is from al Gharra, his first name the same as the mountain’s. He left the village while the Islamic State was in charge, but it is because of a bomb from an American plane that he cannot go back. What happened to his family is the story of just one bomb of the 35,000 dropped so far during 10,000 missions flown in the US-led air war against the Islamic State. Still, the presence of Islamic State fighters in the village was rare. They largely stayed within the base. “We managed to live normal lives most of the time. We had family and friends and loved ones around us. We entered each others’ houses for gatherings or parties. We shared the same happiness and sadness.” The US-led coalition occasionally launched airstrikes in the distance. The ground shook “like an earthquake;” sometimes a house fell down. But it wasn’t the bombs or even the dictates of the Islamic State that made al Hassan first leave home. It was the grinding poverty, worsened by war. ‘There was no bread and no work,” he said. He took his wife and daughter and drove to Turkey. “My father stayed there to keep the house. The moment you leave, IS takes it. All our belongings are there. While al Hassan was in Turkey, as spring turned into summer last year, the war took another turn. Kurdish fighters of the People’s Protection Units, or YPG, controlled territory that stopped just short of the mountain. 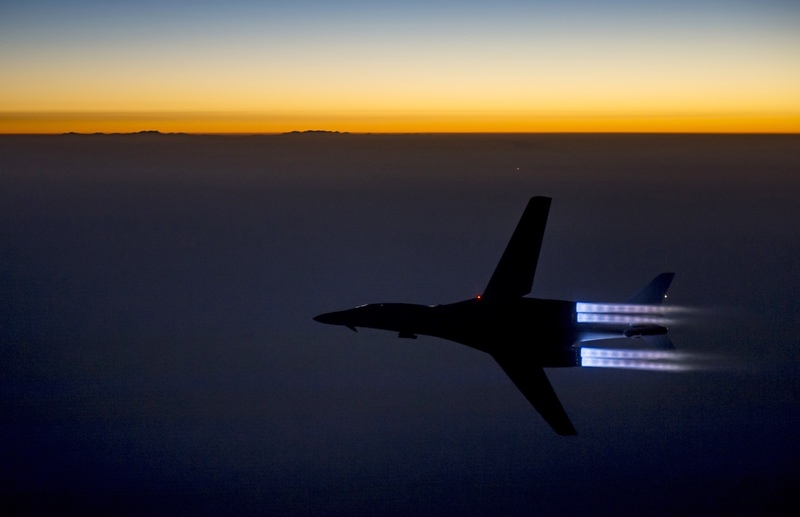 Backed by American air power, they began an offensive to recapture it from the Islamic State. Al Gharra stood in the way. The road to the nearest town — Hasaka, held by the Kurds — was about a mile away from the village. The first bomb fell on that road between 10 and 11 in the morning on May 6 . Then a plane started circling over the village. People were afraid to stay in their homes. They ran into the open. Al Hassan’s father, Ismail, tried to run as well. But he was too late. The villagers remember seeing the plane point its nose down and dive, dropping a bomb. It then climbed away. Al Hassan’s father lay on the ground in a crumpled heap, dead, in front of the ruins of his house. There were no independent witnesses in al Gharra to say whether or not Islamic State fighters were there. The YPG general commanding the assault on what the Kurds call Mount Kezwan thought so, or at least he was inclined to see villagers and Islamic State fighters as one and the same. He was quoted as saying that “many of the local villages are Arab and they often support IS [the Islamic State].” And in the offensive against the jihadist group, the Kurds are often fighting for land they would claim as part of their own future state. They see the Arabs in some of the towns and villages they have captured as aliens with no right to be there. Before they left, they buried his father in a simple grave in the village’s small cemetery. Ismail was 55 and left behind 10 children. Al Hassan was the eldest. “Death comes for all of us. But he wasn’t old and he was the entire family’s provider.” His father’s house — now a pile of rubble — had been home for the whole extended family. “Even if we went back, where would we live? In our destroyed house?” Al Hassan asked bitterly. “Does the American government think we have money? Do they think I can just go back and rebuild our house?” He and the rest of the family are now stuck in Turkey … refugees. As a result of al Hassan’s testimony provided by GlobalPost, US Central Command — CENTCOM — said it would look again at whether it did bomb the village. For now, the United States has no record of killing any civilian in al Gharra. GlobalPost found other instances of US airstrikes — detailed below — that probably killed civilians but which were not officially investigated, or which were investigated and dismissed. In almost a-year-and-a-half of bombing Iraq and Syria, the United States admits to killing just 21 innocent people. An independent monitoring group says the real figure could be more than a thousand. The explanation for the US military’s impossibly low number can be found in the very way it investigates its own airstrikes. A CENTCOM spokesman told us that all civilian casualties were investigated — even if something as insubstantial as an anonymous post to Twitter was the only source. But some US investigations were cursory at best, amounting to what appears to be willful blindness. In an airstrike on one Syrian village — also detailed below — it seems that simple confusion over place names meant that civilian casualties were never investigated and were left uncounted. A coalition spokesman eventually said that CENTCOM would review that case too, after GlobalPost pointed out the village on a map. Standing orders — the Rules of Engagement — give every mission in Operation Inherent Resolve the goal of causing zero civilian casualties. But given the immense firepower deployed in Iraq and Syria, killing civilians is frighteningly easy, especially from the air. American pilots and their commanding officers are heavily dependent on information from Kurdish troops. In several cases we have looked at, witnesses say civilians were at the scene but the pilots — or the Kurds calling in the strike — thought they were Islamic State fighters. In the few cases where the United States admits killing civilians, the explanation is often the same: the civilians ran into the target area just after the pilots pulled the trigger. It is difficult — almost impossible — to visit territory controlled by the so-called Islamic State. But we know about airstrikes from witnesses, survivors, human rights activists, video uploaded to YouTube and even lists of the dead published on Facebook. If you believe that evidence, many more civilians are dying in American airstrikes than the US government acknowledges. People in Iraq and Syria can see what is happening. And so can the enemy. The Islamic State portrays the conflict as a war on Sunnis and a war on Muslims. When the coalition kills civilians — and does not investigate and apologize — the Islamic State fills the void with propaganda. The war against the Islamic State is ultimately a war for Sunni public opinion. Things look very different from the ground. The Pentagon press secretary, Rear Adm. John Kirby, has said: “No other military on Earth takes the concerns over collateral damage and civilian casualties more seriously than we do.” Yet as the examples below show there has been no honest official estimate of how many civilians the United States has killed in Iraq and Syria. Even if civilian casualties are an inevitable part of a “just” war, the Western public is being fed the comforting illusion that war can be fought without shedding innocent blood. And that is simply not the case. Abu Khalil does not support the Islamic State. He is a former civil servant in the Syrian education ministry and once served in the regime army (he deserted). “People in al Khan didn’t like IS and always avoided talking to them,” he said. The villagers even tried to expel them. According to one report, there was an altercation that escalated into an exchange of fire. The Islamic State apparently responded by sending reinforcements to the village. This convoy, it seems, was spotted by the Kurds, who no doubt thought they were seeing a big movement of troops to the frontline — and called in air support. If this version of events is true, it is a bitter irony for the villagers. It would mean their brave opposition to the Islamic State resulted in a brutal attack by American aircraft. Abu Khalil is haunted by that night of carnage and destruction. “It was past midnight. We were sleeping. We were suddenly wakened by a huge explosion. The house shook. The windows shattered. There was shrapnel in the walls. I ran out and saw my neighbor’s house completely destroyed. He told me, ‘Abu Khalil, I managed to rescue my wife and son but I can’t find my six-month-old baby. Help me!’ I could hear people calling from underneath the rubble. My neighbor’s mother was crying out. She’s 70. I pulled her out, along with a boy and his mother. They were all OK.
“My mother and my aunt both came running to help dig through the rubble. But while we did this, a helicopter — an Apache — came overhead. It fired. They had machineguns with explosive bullets. I was hit. I still have the shrapnel in my body. I fell into the hole made by the airstrike. That was what saved me. The helicopter circled round again and fired a second time. My mother and aunt were killed. The woman and her son I’d rescued were killed. Everyone but me was killed. “Three powerful rockets were used in the first airstrike. They left a two-meter deep hole in the ground. Anyone could see the hole until the Kurdish militia filled it. They don’t let anyone go near the place or take pictures. Nineteen people died in that one house. The US military emphatically denied that they bombed al Khan on Dec. 7, though a spokesman said there were airstrikes in the area of al Hawl, a small town a few miles away. But when the spokesman showed us a map marking the location of the airstrike, it was in the same area where a group of local activists had told us al Khan was located. This was where the locals said the rocket attack had taken place. Confusion over place names happens often enough for the US military to plausibly deny responsibility for civilian casualties and to avoid launching a full investigation. There was confirmation of an airstrike on al Khan from another important source — the Kurdish forces on the ground — though they denied there had been any civilian casualties at all. Abu Khalil’s account of the attack is consistent with interviews given elsewhere, though there are still many things that are unclear about the events in al Khan. Exactly how many Islamic State fighters were there? How many of them were killed? Were they close to the house that was hit? As in al Gharra, the village in the shadow of the mountain, there are no independent witnesses. In both cases, the airstrikes were almost certainly called in by Kurdish spotters. Information from the Kurds is passed on to a coalition “targeting cell.” Though the coalition’s aircraft are capable of striking with great precision, what they hit — who they hit — depends on the quality of that information. The coalition rarely has eyes and ears on ground. It is left to the pilots to confirm the target, from thousands of feet up. The limitations of the pilot’s view are clear in the very first report the US published about civilian deaths caused by Operation Inherent Resolve. A family died because two pilots could not see they were there. The report says the pilots simply did not know they were firing on civilians. It was published in November 2015. Until then, the US military had not admitted to causing a single civilian casualty despite 15 months of bombing. The report described an attack on March 13 of last year against an Islamic State checkpoint outside al Hatra in northern Iraq. Al Hatra is the site of one of the world’s oldest cities, dating back to the 3rd Century BC. Saddam Hussein restored the ruins, laying bricks stamped with his name into the ancient walls. When the Islamic State arrived, they used sledgehammers, Kalashnikovs and a bulldozer to demolish what they believe are the city’s “idolatrous” statues. Then they turned the site into a training camp, installing a checkpoint on the road nearby. Two US aircraft were given permission to fire on that checkpoint because it seemed — to the pilots and to everyone involved in the so-called “kill chain” — that no civilians were in the strike area. But a Kia sedan and a Chevy Suburban had been stopped at the checkpoint. They were there long enough for the pilots to think that the vehicles were helping the fighters there. Evidence emerged later that members of a family were in the car: two women and three children. The Suburban is thought to have had at least one other civilian and perhaps too, a family group. Through the dense thicket of military acronyms and jargon in the report, the horror of what happened emerges. The planes were A-10 “Warthogs,” snub-nosed aircraft used against tanks. The A-10s are built around a huge seven-barrel machine gun, like a Gatling gun, the “GAU Avenger,” which fires 50 to 70 rounds a second. Each shell is the size of a bottle of beer and the nose is weighted with a third of a kilogram of depleted uranium. One bullet can cut a human being in half; a stream of them can punch through armor or turn a person into red mist. The Warthog’s cannon makes a distinctive, terrifying noise during an attack. The gun fires so rapidly it sounds like fabric tearing, or a piece of heavy furniture being dragged across a wooden floor (as one journalist described it while watching A-10s over Baghdad in 2003). The two Warthogs in al Hatra came in on their strafing run. They would have fired in two-second bursts, hitting the vehicles and checkpoint with at the very least 200 rounds, probably more. According to the report, four people got out of one of the vehicles just after the cannon was fired. The bullets hit the vehicles, which exploded in a ball of fire, incinerating everyone close by. “Post strike, both vehicles are on fire and it appears like there is one person still moving at the rear of the sedan,” the report said. As in al Gharra and al Khan, the victims may well have been people who opposed the Islamic State. The women and children were killed as they were trying to leave territory held by the militant group, according to an email sent to the US military by an Iraqi woman. (The email was sent to claim compensation for the destroyed vehicles.) Prompted by the email to investigate further, the US military found its own evidence that non-combatants had been at the scene. Analysis of video from the Warthog’s camera in the “targeting pod” on the wing showed people getting out of the car and: “One of the persons observed … presents a signature smaller than the other persons. This was assessed as a possible child.” Officials determined this by measuring the height of the shadow when the image was blown up on a large screen. US forces, then, have orders to try not to kill civilians — it is a mission objective. But that is not the same as an absolute prohibition. And the National Security Council spokeswoman, Caitlin Hayden, has said that bombing in Iraq and Syria would not be held to the same safeguards used in Afghanistan, which only allow strikes when there is “near certainty” of no civilian casualties. While the standard for strikes may be rigorous — a goal of zero civilian casualties — a target can be ruled free of non-combatants based on little more than an educated guess by the pilots. The pilots’ methods are reminiscent of the CIA’s controversial “signature” strikes in Afghanistan and Pakistan. Those strikes are called in based not on certain intelligence but because targets have suspicious patterns of behavior, "signatures" of terrorists. Being present in a militant area could be enough. This is exactly the kind of judgment the Warthog pilots used when targeting the two vehicles held at the Islamic State checkpoint. The report into al Hatra also said that one of the planes dropped a 500-pound bomb on a shack at the checkpoint. “Prior to weapon impact but after weapon release a single adult sized PAX (person) is seen slowly moving to the north,” the report said. “This person is knocked down by the weapon impact and not seen moving again.” Was that a fighter, or a farmer? It is impossible to say. On June 19, 2015, near Tall al Adwaniyah, Syria, during a strike against two ISIL vehicles, it is assessed that one civilian was injured when appearing in the target area after the US aircraft released its weapon. On June 29, 2015, near Haditha, Iraq, during strikes against one ISIL tactical unit and two ISIL vehicles, it is assessed that two civilians were injured. After the US aircraft engaged the target and two seconds prior to impact, a car slowed in front of the ISIL vehicles while a motorcycle simultaneously passed by. On July 4, 2015, near Ar Raqqah, Syria, during a strike against an ISIL High Value Individual, a car and a motorcycle entered the target area after the weapon was released. It is assessed that three unidentified civilians were likely killed. In all these cases, the Pentagon’s reporting says that people wandered into the firing line after the pilot had squeezed the trigger. That is a consequence of fighting in built up areas. Taking all the published investigations so far, the US military acknowledges causing the sum total of 22 civilian deaths in the campaign against the Islamic State. Such a low number is wildly implausible. Airwars, an independent monitoring group that tracks allegations of civilians casualties, says that at least 862 and as many as 1,190 non-combatants have died in coalition strikes in Iraq and Syria. The Airwars count is made by collating reports from several sources for each strike: human rights activists and the media, Facebook posts, and testimony from survivors and relatives of the dead. Each casualty report is judged credible based on the amount of detail and whether it is consistent with other evidence. The head of Airwars, Chris Woods, says the “smart bombs” used by Western air forces have clearly reduced the risk to civilians on the battlefield. Nevertheless, he says that in Afghanistan, for example, more civilians died in airstrikes than were killed by foreign ground troops. Airpower was the single greatest cause of civilian death by international forces, killing one civilian for every 11 airstrikes. In Iraq and Syria, the ratio could be even worse, he says, because there are more attacks on “targets of opportunity” than those based on intelligence. And the campaign is being fought mainly in built-up areas where it is hard to distinguish the enemy. In September 2014, doctors at a hospital in the southern Turkish city of Iskenderun were presented with a mystery. An injured Syrian boy, four or five years old, was brought there in a coma. He had no identifying documents and no parents, or anyone else, claimed him. Doctors wrote a Turkish name on his chart and kept him in intensive care. They would learn later that the child came from a village called Kfar Derian, just over the border. He was a victim of the very first US airstrikes in Syria. How the coalition responded to what happened in Kfar Derian at least partly reveals why official figures fail to show the true extent of civilian casualties. After the attacks he was asked by local people to go to Turkey to look for a mother and son whose bodies could not be found in the rubble. Three days later, he found the mother in a mortuary. After a week, he still couldn’t find the little boy. “We searched everywhere for him.” Then, having almost given up hope, he showed a picture of the boy at a hospital. Doctors recognized him. Humam did not wake up for months. He is now an orphan — his mother, Fatima, and his father, Mohammed, are both gone — living in a children’s home, and very far from the alert, inquisitive little boy he used to be. 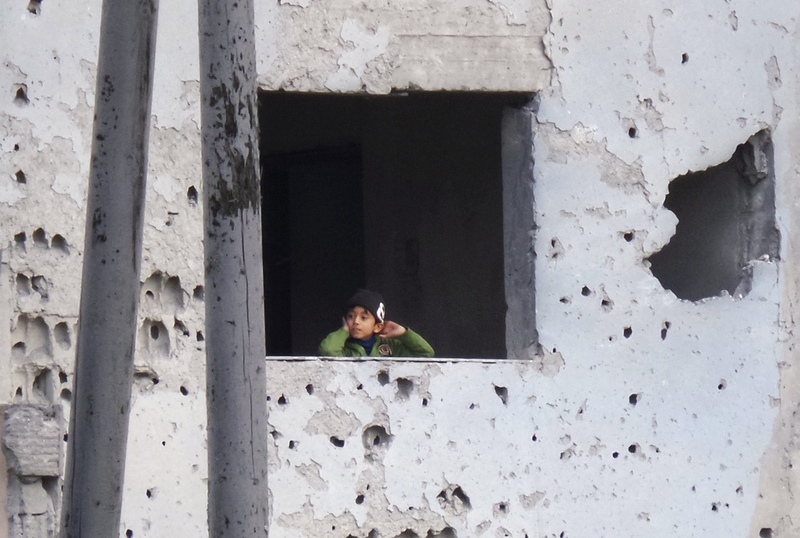 Abu Mohammed calls him the sole survivor of a massacre. “Houses were bombed,” he said. “Families died. There were no survivors. The only one who lived was that child.” His testimony has differences with the activists’ account, most importantly his claim that no fighters were in the village. But both agree there were civilian casualties in Kfar Derian. The US military says the eight missiles did not even succeed in wiping out Khorasan. The militants slipped away, tipped off by reconnaissance flights before the strike. Abu Mohammed said: “A day before, there was many scout planes over the area that was bombed. 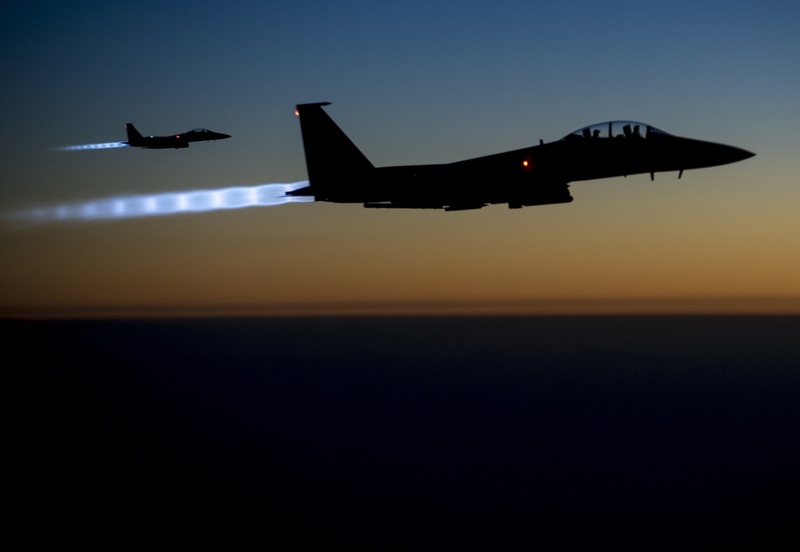 The conventional wisdom is that bombing must increase support for the Islamic State. The conventional wisdom may be wrong, although it is hard to be sure as there is no way to measure public opinion in the “Caliphate.” In the early days of the campaign in Syria, there were some anti-coalition demonstrations with placards declaring: “This is a war on all Sunnis.” But they may have been orchestrated, with people press-ganged to attend. There have been few, if any, large and spontaneous popular protests against the bombing. That maybe because the coalition has killed relatively few noncombatants in Syria compared to the Islamic State and the regime. In January 2015, a group of Syrian doctors said that indiscriminate air attacks by the regime caused 80 percent of civilian casualties, while the Islamic State caused 15 percent, and the coalition 5 percent. But those who are directly affected by US bombs are, as you would expect, bitter. “You build in your countries and destroy in ours?” asked Abdul-Aziz al Hassan, who lost his father in the bombing at al Gharra. “Is this how you bring democracy? Stop it. Really, stop it. People are tired.” Abu Khalil, survivor of the devastating attack in al Khan, said he wanted compensation from the United States for the death of his mother. Abu Mohammed, who spoke to us about Kfar Derian simply condemned the United States as “Zionists,” echoing both jihadi and regime propaganda. He wanted nothing to do with America. All of them sounded more weary than angry. Update: This story has been updated in light of new information in the al Khan case. Correction: An earlier version of this article stated that the coalition had admitted to 22 civilian deaths. The actual number it has admitted to is 21. Paul Wood is a BBC Middle East correspondent and contributor to GlobalPost’s Longreads on Conflict. This story was cross-posted by our colleagues at GlobalPost.